Hillary Chybinski: time and other stuff. . .
time and other stuff. . .
. . .so the "baby" is going to be 5 months old soon. . .where has the time gone? 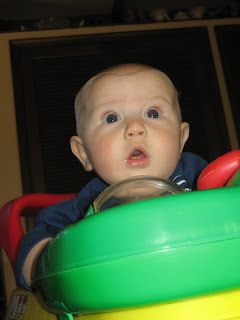 he is ready for an exer-saucer and according to the "what to expect" book, a sippy cup! YIKES! how did that happen? i said to myself, if i had the chance to do it again, i would savor every moment. . .well those moments are flying past me at a frightening rate of speed. . .ryan is growing up as well, kindergarten is more than half over already. . .
here's to trying to slow down time - at least for a few days. . . There's no slowing. Nick will be graduating from HS in a couple of months and then out into the real world. Do you remember when he was a little as Owen? Seems like yesterday!